Please contact artist with any questions. Sonia is a painter, printmaker, and art educator who delights in sharing the world of creative expression. 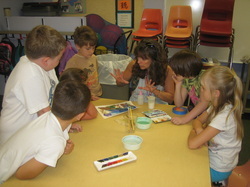 Since 1998 she has taught through Salem Art Association's Community Art Education program, and for the past few years has facilitated Family Art Days at the Hallie Ford Museum in Salem, Oregon. She also teaches private and group art classes to children and adults. Sonia studied art before obtaining degrees in Communication Disorders and Audiology with a focus on working with children. Prior to returning to art full time, she worked as a clinical audiologist which fed her interest in science and problem solving. Her love of travel and teaching has allowed her to bring art to students in Canada, Brazil, and Turkey. When not in the classroom, she enjoys reading, gardening and cooking, which in turn provide inspiration for sketchbook journals and other studio work. Her artwork reflects an interest in nature, landscape and growing things, inviting the viewer to see beauty in humble, everyday surroundings. Sketchbook journaling is an adventure. My gelatin monotype, "Crossing Over," won the Ink Spot Sponsor Award at Salem's 2013 Something Red Show!